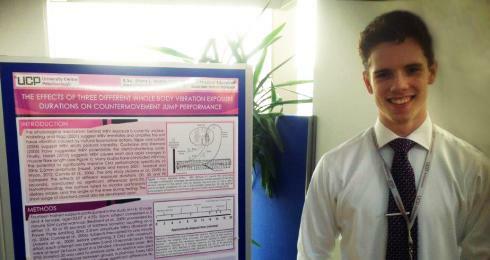 University Centre Peterborough held it's first Undergraduate Research Conference for Sports Coaching and Physical Education. The conference was presented by all of the final-year Sports Coaching & Physical Education undergraduates, showcasing their major research project work. External businesses are invited to network with students, providing talks on industry standards and career opportunities. Staff provided an overview of the curriculum as well as new developments. "The conference provided an excellent opportunity to showcase research to rest of the student body, as well as prospective employers and allowed for ourselves to develop new skills in presenting to a larger number of people. Overall I believe the event was successful and would encourage other students to make the most of these events in the future." "Presenting our research findings at an academic conference was a new and unfamiliar challenge but it was a really positive experience for everyone. It was a highly successful event and the opportunity to meet and exchange contacts with employers was a great incentive to make a positive impression"
"I thought the conference was a brilliant opportunity to present my final research project in a rewarding and social environment. It allowed us to establish contacts with businesses and employers, and gave potential students an insight of what to expect when studying at UCP!" The conference was supported by Kalsoom Akbar, Michael Botchway, Lauren Broom, James Brown, Ayden Campbell-Brazier, Keith Clark, Dave Cope, Luke Cossey, Jones De Sousa, Matt Edgell, Daniel Evans, Arthur Jones, Adam Lomas, Kashara Mccrea, Ben Paull, Craig Riddell, and Rebecca Smithurst.